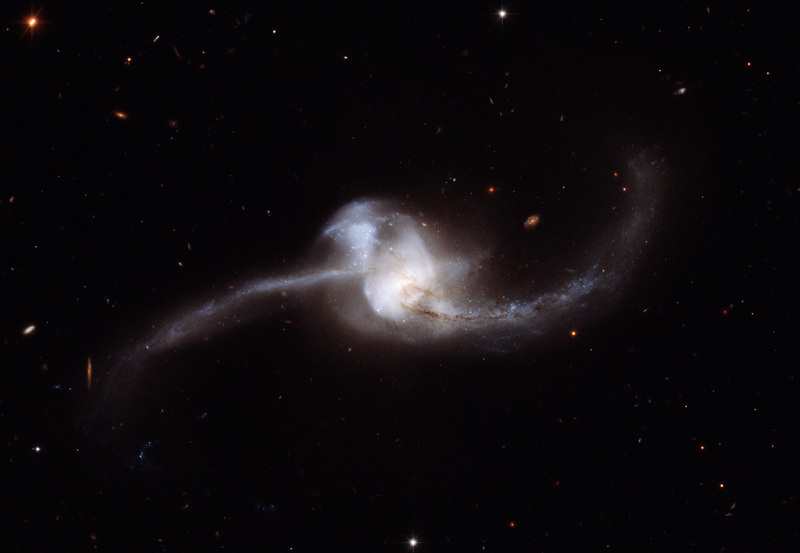 Galaxies come in many different shapes, sizes, colours and ages, and understanding what drives galaxies to evolve the way that they do puzzles astronomers every day. But occasionally, we come across a galaxy that makes everyone go ‘huh?’, which is the case for one of the less impressive-looking galaxies seen in Figure 1. The image shows two large well-known galaxies: NGC 4647 and M60 (also known as NGC 4649). These galaxies are members of the Virgo Cluster, which lies around 54 million light-years from our own solar system. Figure 1: The larger panel shows a Hubble Space Telescope image of the M60-NGC 4647 system. To the lower right of M60, we can see the ultra-compact dwarf (UCD) galaxy, M60-UCD1. The smaller panel shows the contours of the brightness of the object. This image is from NASA/ESA. Now, M60 has a very interesting little friend called M60-UCD1. This galaxy is called an ‘ultra-compact dwarf’ (UCD) because it’s very small and dense as far as galaxies generally go. The effective radius (the radius which contains half of the total light of the galaxy) of M60-UCD1 is only 24 parsecs (78 light-years), but packs a mass of 140 million solar masses. Astronomers are not entirely sure how these objects form, and there may be multiple ways that these objects assemble. For this object, however, the most likely scenario is that this was once a much larger galaxy. The authors suggest that M60-UCD1 has been tidally stripped due to a close call with its giant friend M60. This means that the galaxies have interacted with each other and the gravitational force of M60 has disrupted the stars, particularly in the outer parts of M60-UCD1. The evidence that motivates this scenario is that something pretty extraordinary is going on in the center of this tiny galaxy. It is widely believed that all massive galaxies host supermassive black holes (SMBHs) at their centres. Observations also show a tight relation between the mass of the bulge of the galaxy and SMBH mass, suggesting that they both evolve and grow simultaneously. But the SMBH in the centre of these galaxies is typically less than 1% of the total mass of the bulge of the galaxy. From the mass of the stars in M60-UCD1, we would expect a SMBH mass of approximately 1 million solar masses. But the authors of this paper deduce a SMBH mass of 21 million solar masses. This is 15% of the total mass of the galaxy! This indicates something weird is going on. We can see below a simulation (made by one of the coauthors on this paper) laid over the image of M60 and M60-UCD1, demonstrating a possible interaction between these two galaxies. Initially, the galaxy that later was left as M60-UCD1 was a larger elliptical galaxy of 10 billion solar masses. And of course, the beauty of simulations means we can end up with the UCD galaxy perfectly where it’s observed! So we’re pretty certain this is the nucleus of a once larger galaxy. Now what does this individual galaxy mean for the wider Universe? Well, many UCDs have been observed in the past, and some have had similar properties that no one has been able to explain in as much detail as M60-UCD1. So the authors infer that perhaps this particular population of UCDs all contain SMBHs. This means that when we look at a cluster of galaxies, for example, assuming just the massive galaxies contain SMBHs is most likely wrong! Including these UCDs may more than double the number of SMBHs, resulting in a large increase in the massive black hole number density in our local Universe. Further work is still being conducted on this, but being able to see the motion of these stars, particularly very close to the centres of these dwarf galaxies, requires the galaxies to be relatively close by. And after all, studying SMBHs, which are ultimately impossible to directly observe, is always going to be a challenge!